Jennifer joined Animal Hospital of Ivy Square in December 2004. As our hospital manager, her responsibilities include client relations and correspondence and assisting the doctors in all areas of the hospital, from team scheduling and inventory management to blood draws and patient care. Before joining the team, Jennifer was a veterinary technician at an emergency hospital. At home she care for Dixie, a Lhasa Apso and Pepper, a Yorkie Poo. Jennifer also has two Arabian Mare horses named Jasmine and Foxy. Calm and compassionate, Shannon is a veterinary assistant who joined Animal Hospital of Ivy Square in June 2012. Her responsibilities include X-rays, dentals, surgery preparation, lab work, prescription filling and general hospital maintenance. She especially likes caring for our patients and helping our clients understand the importance of preventive care and vaccinations. "I enjoy working with the amazing team we have," she says. "The entire staff is very knowledgeable and we all share a passion for helping animals." Shannon spends her free time with her husband Joe and children McKenzie and Gavin. She also loves being outdoors, baking, dancing, and playing board games. She and her family have three dogs, Scooby, Reese and Hunny, and two cats, Charlie and Chloe. 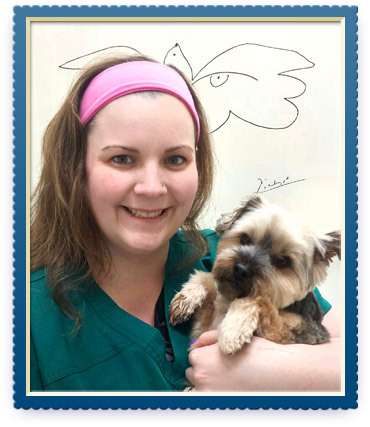 Danielle joined the Animal Hospital of Ivy Square team in January 2016. She is currently enrolled in a veterinary technology program en route to become a licensed veterinary technician. 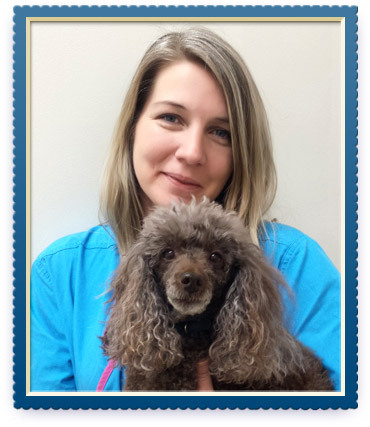 In addition to her role as a client care specialist, her veterinary assisting responsibilities include patient appraisal, temperature, pulse, and respiration checks, surgical assistance, post-operative patient care, lab work, anesthesia monitoring and general patient care. Outside of the hospital, Danielle enjoys skiing, camping, traveling, volunteering at the CASPCA and spending time with her two dogs and three cats. After traveling across the west coast, Sommer decided to settle down in Virginia. Among two goats, three dogs, four cats, and ten chickens, she enjoys creatures large and small! As a client care specialist for the Animal Hospital of Ivy Square, her duties include appointment scheduling, client assistance, and all aspects of client care. She makes all of our clients and patients feel that they are special and welcome. Outside of work, Sommer enjoys reading, writing poetry, gardening and cooking.